Kaitake redoubt was built on one of the Māori pā captured by a combined force of 57th Regiment and local troops on 25 March 1864. It was situated high on a spur of the Kaitake Range, overlooking the present township of Ōakura. 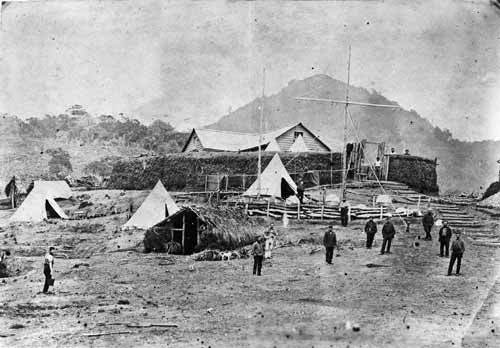 This photograph was taken in the summer of 1864–65 when the redoubt was occupied by Captain Hussey’s company of Taranaki Military Settlers. Redoubts were built from alternating layers of earth and fern. Within the earthworks the wooden blockhouse forms the defensive centre of the fortification. Communication with other nearby military posts was accomplished by a simple code using balls made of canvas-covered supplejack, visible at the base of the signal mast.